LV (Left Ventricular) Hypertrophy refers to an enlargement as well as thickening of the walls of the heart's main pumping chamber known as left ventricle due to conditions like high blood pressure or a heart condition that causes the left ventricle to work harder. As the workload increases, the muscle tissue in the chamber wall thickens and in some cases the size of the chamber itself also increases. As a result, the enlarged heart muscle loses its elasticity and eventually fail to pump with as much force as required. It is most common in people who have uncontrolled high blood pressure. The developing left ventricular hypertrophy can create a risk of heart attack and stroke. WHAT ARE THE SYMPTOMS OF LV HYPERTROPHY? 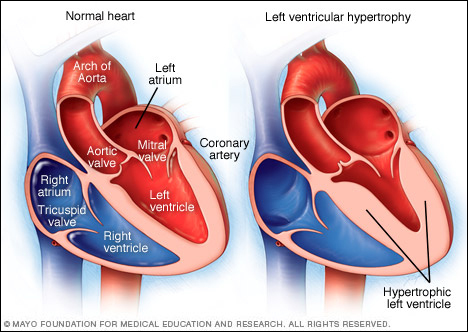 Left ventricular hypertrophy usually develops gradually. Sometimes patients may experience no signs and symptoms, especially during the early stages of the condition. Chest pain often after exercising. Sensations of rapid, fluttering or pounding heartbeats (palpitations). There is a chest pain that lasts more than a few minutes. Severe, recurring light headedness or lose consciousness. WHAT ARE THE CAUSES OF LEFT VENTRICULAR HYPERTROPHY? Hypertension (High Blood Pressure): It is the most common cause of LV Hypertrophy. Nearly 1/3rd of the people suffering from LV hypertrophy have hypertension. Athlete training: Intense, prolonged endurance and strength training can also cause the heart to adapt to handle the extra workload. Aortic Valve Stenosis: The narrowing of the tissue flap (aortic valve) that separates the left ventricle from the large blood vessel leaving the heart (aorta). The narrowing of the aortic valve makes the left ventricle to work harder in order to pump blood. WHAT ARE THE COMPLICATIONS OF LV HYPERTROPHY? Interruption of blood supply to the heart. Irregular, rapid heart beat that decreases blood flow to the body. Aortic root dilation: Enlargement of a section of the aorta. Treatment of the LV Hypertrophy depends on the underlying cause. In modern medicine, various angiotensin converting enzyme inhibitors as well as angiotensin II receptor blockers are prescribed but these medicines cause side effects as well as don't work on the root cause of the disease. Mother nature has gifted us so many medicinal herbs with immense health benefits. Medicinal herbs focus on the prevention and treating the underlying problems not just symptoms. Moreover, Ayurvedic system of medicine is older than the western system of medicine. Herbal medicines work with the body’s processes to heal, they are safer than the prescription drugs and surgery and a lot more affordable. 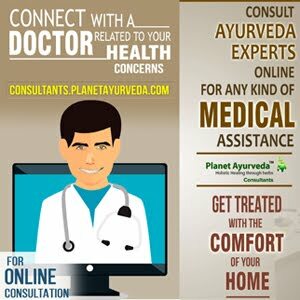 Planet Ayurveda offers best combination of effective herbal remedies such as Heart Care Pack for the management of heart diseases. Consuming herbal remedies for LV hypertrophy do not cause any side effects and these herbal remedies can be taken with all the heart medications prescribed by other physicians and slowly the physician will automatically reduce the dosages as there will be improvement in the patient’s test reports. Arjuna Capsules of Planet Ayurveda are prepared from Terminalia arjun bark extract. The chemical constituents of Arjuna bark are arjunic acid, gallic acid, ellagic acid and terminic acid, various glycosides and some minerals. Because of its chemical constituents, it is a rich source of anti-oxidants and therefore widely used in Ayurvedic practice for various heart ailments. Arjuna capsules also bring down high cholesterol levels and high triglyceride levels. Dosage: 2 capsules twice daily. The benefits of Arjuna tea are immense. It not only lowers high blood pressure and high cholesterol levels but also strengthens heart muscles. 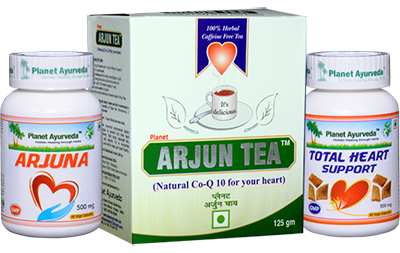 Arjun tea contains natural flavonoids, cardiac glycosides and rich in natural coenzyme Q 10 which makes it a very effective tea in treating heart ailments. It is a caffeine free herbal tea and is quite effective heart care remedy. Its delicious taste makes it easy to consume. It is a healthy and delicious tea and does not cause any side effects. Dosage: 2 cups twice daily. Total heart support capsules of Planet Ayurveda is prepared with Arjuna bark extract, ashwagandha extract, brahmi and shankhpushpi. Total heart support capsules improve heart functions and also help in lowering high blood pressure. These herbs also balance Vata and Pitta doshas in the body which are responsible for stress, nervousness, anxiety and various heart ailments. These capsules are very effective in high cholesterol, breathlessness, myocardial infarction, congestive heart failure and also support heart muscles. This formulation of Planet Ayurveda also detoxifies the blockages in the arteries. The herbs Brahmi and Shankhpushpi relieve stress in today's life. Include fruits that are rich in Vitamin C in the diet such as amla (Indian gooseberry), lemons etc. Increase the intake of fruits, vegetables, whole grains in the diet. Intake of junk food, fried foods is not recommended. Incompatible food items like: taking fish with milk is not recommended as this combination vitiates the blood and obstruct the channels of circulation. Non-vegetarian diet should be strictly prohibited. Raw garlic can be consumed as it regulates the blood pressure, high cholesterol levels and also fights cardiovascular diseases. Include turmeric in the diet as it has anti-oxidant and anti-inflammatory properties. It can improve cardio-vascular health by increasing blood circulation and preventing the formation of blood clots. High salt or sodium can raise the blood pressure. Potassium counters sodium ill effects. People suffering from hypertension can benefit from the intake of potassium. Good sources of potassium are bananas, orange juice, low fat yoghurt etc. Include brisk walking for 30 minutes daily. Uncontrolled stress, insufficient sleep lead to various heart ailments. Meditation is the best medicine for stress management.